Stomatocytes are the concave shaped red blood cells. Central portion of stomatocytes have slit like pallor appearance. Stomatocytes appear as the shape of coffee beans or kissing lips. The three dimensional view of stomatocyte show it as a bowl because the cell is not biconcave anymore due to the defect in membrane. The stomatocytes may also occur due to the alteration in permeability which causes the increase in volume of red cells. When the blood is at low acidic pH the stomatocytes are formed and the blood be at low acidic pH by more interaction with cationic detergents and also in patients who are taking chlorpromazine and phenol thiazine. The stomatocytes may be inherited or acquired. If the stomatocytes are inherited, the presence of mild anemia and on-going hemodialysis findings shows the clinical condition named stomatocytes. The inherited cells having null phenotype Rh factor become fragile. These fragile cells tend to become stomatocytes. 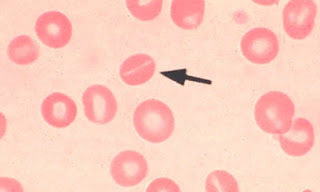 This type of phenotype on cells can cause the varying degrees of chronic hemolytic anemia. Stomatocytes are also called hydrocytes. Stomatocytes can be seen acquired from the liver disease at chronic stage or due to the acute alcohol intoxication which is transient in nature. Stomatocytes may be acquired or hereditary. It can be acquired along with the liver diseases which are at chronic stage. It can also be developed due to acute alcohol intoxication in body. The alcohol intoxication is transient and can be resolved. The stomatocytes which are inherited from parents are due to the mutation in the erythrocyte membrane protein, at the location of band 3. The protein in the erythrocyte membrane is responsible for the mediation of cat ion leaks which causes the formation of stomatocytes. This can also occur due to the presence of null Rh factor on the cells. Stomatocytes presence in body may lead to many diseases related to red blood cells. Occurrence of anemia is the most common disease occurs as a result of stomatocyte formation. Hemolysis will be shown in histology report of blood. Stomatocytes may lead to the moderate to severe hemolytic anemia which may persist lifelong. Most common type of anemia seen with stomatocytes is hemolytic anemia. Some cases of stomatocytes formation also shows the symptoms of vaso-occlusion which include dyspnea, pain in chest region, and pain in abdominal area particularly after splenectomy. Basically there is no such treatment for stomatocytes but the etiological factors must be treated to control the condition. Patient with hemolytic anemia take supplements of folic acid. Folic acid contains vitamin B9 because the red blood cells consume this vitamin to a greater extent. Transfusion of red blood cells is also required in the crises. There may be problem in clotting of blood so along with other supplements the anticoagulant drugs are also prescribed. The splenectomy is strictly contraindicated in the acquired stomatocyte formation, but it can be carried out in patients with inherited stomatocytes.